That urge you get to scratch an itch? It turns out dairy cows have it too. At the UBC Dairy Education and Research Centre in Agassiz, B.C. 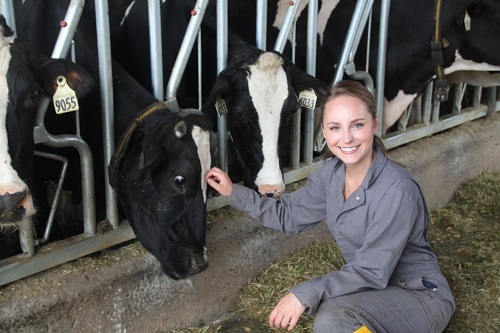 (dairycentre.landfood.ubc.ca), Emilie McConnachie (BSc Applied Biology 2018), designed and conducted a study that investigated dairy cows’ motivation to access a mechanical brush for grooming. The study was made possible due to an Undergraduate Student Research Award (USRA) from the Natural Sciences and Engineering Research Council of Canada (NSERC), which McConnachie received in 2016. She set up mechanical brushes behind a weighted gate that the cows could push with their heads to gain access. The weights were gradually increased over time, meaning that cows increasingly paid a higher price to access the brush. An identical set up was used with fresh feed behind the gate. The study was published in Biology Letters in August, and was picked up by media outlets such as the New York Times, the National Post, and CBC News. The following year, McConnachie received a Mitacs Globalink Research Award, which took her to Florianópolis, Brazil, for four months where she was part of a research collaboration investigating public attitudes towards genetically modifying agricultural animals to have better welfare. The findings of this study will be published next spring. McConnachie went on to receive a second NSERC-USRA before graduating from the Faculty in 2018. She is currently in a doctoral law degree program at the Northwestern Pritzker School of Law in Chicago, IL.